Step away from the tomato plant and no one gets hurt. 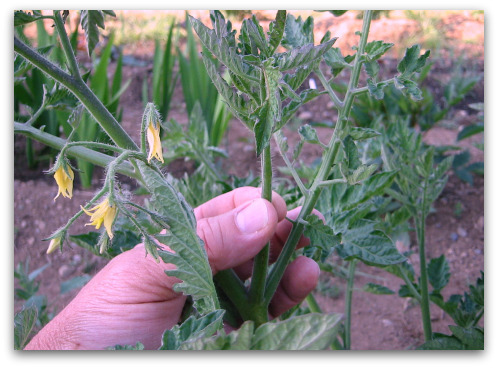 Garden myth: you should pinch tomatoes suckers (the growth between main stems and the leaf) for a better tomato crop. I ‘ve been growing tomatoes since I could say spaghetti sauce, and I’ve found that pinching the suckers is something every garden resource seems to preach as the gospel–a dire must-do when growing tomatoes. But In my experience, it’s a big ol’ waste of time that diminishes your harvest. If you want just one big tomato at the end of the season, then I’d say go for it. A tomato plant is not a bonsai tree. You want it to grow and glean as much energy from the sun to produce sugars for the star feature of your next BLT or caprese salad. I liken it to removing sails from a sloop and wondering why it doesn’t move as fast. Leaves harness the sun’s power, sails the wind’s. Don’t short yourself on either. People who grow dahlias know to pinch the lead growth so as to produce more suckers and thus more flowers. I would not pinch the lead stem for a tomato plant, as the suckers automatically show up. Another thing I’ve observed is that if you leave the tomato plant’s side shoots alone, they mainly appear from the base of the plant, and not such much on new growth as the season continues. Why? Because they are concentrating their energy on producing fruit for your next Salad Nicoise. I trellis my tomatoes; don’t get me started on cages. Next articleSeattle: Just How Hot Was It? I’ll be interested in how those little gems fare for your Mom. ummm, Jersey toms! Just today I was out in the garden fretting about the fact that my mama told me to ALWAYS pinch the suckers, and of course I NEVER pinch the suckers. I’m a sentimental gardener (often to my detriment, as when I let the poppy weed keep growing in the cabbage patch just because I love poppies). SO…it is nice, so very nice, to find out that my squeamishness at thwarting any part of my tomato plants is actually a virtue. I’m just not telling my mother I took your advice over hers. June, Your secret’s safe with me. O.K… Years ago a friend’s mother told me I HAD to pinch off the suckers. I started pinching immediately, but the ones that I missed would produce lovely tomatoes. I agree… all pinching does is reduce your yield. AND, I just found some wilt on one of my Purple Cherokee. I’m removing and disposing the leaves the moment I see it. We are now over 7 inches below our normal rainfall for the year. What do you think, Tom? Do I get wilt because 1) it’s an heirloom and not disease resistant 2) I’m using a sprinkler to water my tomatoes since we no longer receive rain 3) I’m being punished for some reason and will not have one homegrown tomato in August. Eileen, I hear it’s better to hand water and keep the plant dry to discourage wilt. One summer we had a rare August downpour and in three days every tomato plant I had was suffering from wilt. I’ll do a little research. If you can, I’d hand water at the base of the tomato — but looking at your site, you garden is looking pretty dreamy to me. I know. I should be using a soaker hose. It’s always on my list of things to do. You guys probably don’t need it but Texas heat must be kept from the roots. Mulching not only holds moisture in, it holds moisture, not to mention the nutritive benefits. Note: keep it away from the main stem on your tomatoes. I think this is the answer. We do it in the UK so that the whole plant gets sun. It’s not hot here all summer. I think that’s where it comes from. Probably not an issue in Texas. Seriously, when are you going to start selling the bounty at the local farmers’ market? I’m working on it — I’m working on it! 😉 If not late this season perhaps next! I was delighted this year when our son suggested a “joint” garden on his property. It’s been years but was eager once again to get my hands dirty. Everything looked great until the tomatoes and green beans started to wilt. Being a distance from water, our son had a barrel with which we could carry water. Unfortunately it didn’t seem to help, even after a rain wilting persisted. Then we heard from friends about walnuts affecting tomato plants. Our healthy tomatoe plants now are loaded with tomatoes that appear to be stunted and the plan is dying. My guess is that has been the problem with the green and yellow beans. Wanting to avoid the issue next year, how far away should the garden be from the tree??? I planted limited vegetables this year and want to expand the selection next year, what vegetables will be affected by the walnut tree?? Any suggestions/help you can give would be greatly appreciated. Tom, I’d like to see more pictures of how your tomatoes are trellised? I tied mine from the base of the plant to overhead frames this year and they are so heavy with fruit they are breaking the frames. I’ve canned tomatoes, marinara, tomato soup, tomato juice and we’ve been eating like crazy. I have another 20 pounds upstairs to do tomorrow and probably 2 more batches like that in the next 2 weeks. And some of my tomatoes haven’t even begun to ripen. Maybe 30 tomato plants was too many? But you never know here in Seattle. And I even pinched my suckers! Hi Nancy, sounds like the dreaded walnut wilt which is prone to areas around black walnuts trees more so than the English type (the nuts found in oatmeal cookies). At my last house in Seattle, I had a black walnut tree on my property. Some things would do okay under the tree and other plants had nothing to do with my poor site choice and suffered because of it. 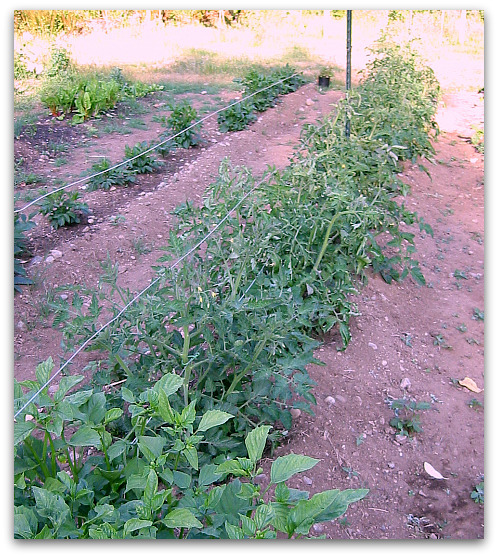 The links share some resistant tomato varieties and I rotate crops religiously and never plant tomatoes in the same place or where potatoes once were. I also try not to water the leaves of the tomato vines. Good luck and good gardening! Annette, you are one supreme tomato grower — Wow! I’ll be happy to post some pics on my tomato trellis. I really like it a lot and find it’s easy to maintain and easier to weed and pick. Basically, it’s two anchor posts that I run wire down, a strand every one foot on the post, so it pretty much looks like a horizontal wire fence section. I “espalier” the tomatoes on that vertical plane and it keeps them nice and tidy. I’ll post pics as it will give you a much better idea of how this works. And if you need another recipe for tomatoes, I cut them in half any and every type, slow roast them at 200 degrees on a cookie sheet with salt, pepper and drizzle of white basalmic vinegar (or sherry vinegar) and olive oil. When the toms are pasty or sludge-like I pop the whole mess in a freezer bag for future pasta dishes –um um good! Hi Jennifer, it could be a couple things. You may have varieties that are small by nature in the category of cherry or grape tomato, like sungold or sugar lump or red currant. And it also sounds like they may need more water. I hand water mine at the base of the plant and I have a berm built up to create a crater that holds water. I water heavily once a week, if no rain. For the bigger tomatoes, I like Lemon Boy, Northern Exposure, Black Krim or Black Prince. My all time favorite is an heirloom variety called Pineapple and Old German by some. Next year dig big deep holes and add composted cow manure (comes in bags) . It really pays off as they are heavy feeders. Good luck and good growing! I grew a Black Prince this year, and found that any kind of pruning of it made it wilt as though it were pained. I stopped and have a very nice yield. As for watering, I use a plastic mild jug with a hole bored into the lid. I cut the bottom off and fill it every morning and every evening with water. It sends the water in a steady dribble to the root system. When it rains I take the jug away. I grew mine in a pot, and cut the slits in the side all around so that downpours drain, but a small amount stays at the bottom. Love the milk jug idea. I tend to plant my tomato plants in bowls or craters with a berm to hold the water, as the water runs off otherwise. I just dig a large hole and plant the tomato lower than the grade of the garden. Hi Jennifer, I’ve never found pruning necessary for my tomato plants no matter how heavy the crop; the stems seem to handle as much weight as the tomato cares to deliver. The most beautiful and productive tomatoes I’ve ever seen were untrellised and unpinched, left to their own devices in a field in Yakima, Washington. Sometimes conventional wisdom keeps us from trying new things. Take two of the same tomato plants and try pinching one and not the other and see what happens. As far as spacing goes, I have the room so I space them about 2-3 feet apart. You want to keep good air circulation around the plants so try not to crowd them. Hi Jennifer, good questions all. Here’s my take on watering tomatoes. Too much water creates a lush plant, but make diminish fruit size and number. 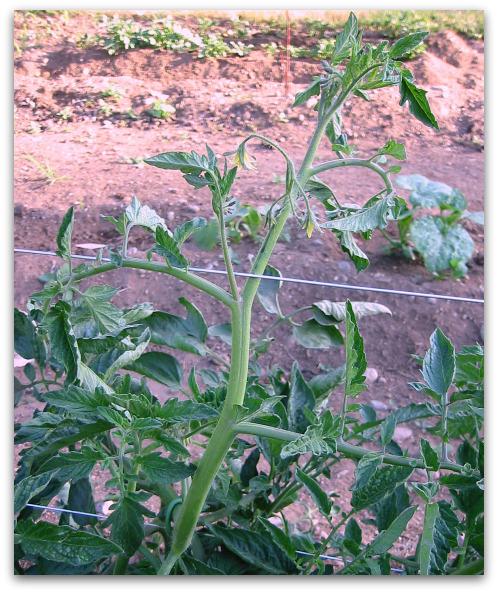 Rather than creating a watering schedule, look to the tomato plant for the answer as to when its thirsty. I look for my tomato plants’ leaves to start drooping or wilting in the heat of the day. Then I wait until the evening when they rebound with cooler temps and I hand water, being careful to no get the leaves or fruit wet. The plant has the entire evening to rebound and quench its thirst. I believe they grow better at night. Too many growers work too hard to pamper the plant. I say don’t. If it’s slightly stressed, it works harder to produce fruit, not foliage. Tom, I agree no pinching. I planted 8 plants last year and was getting about 30 to 40 pounds of tomatoes a week for the whole month of August. I had to give them away, but they looked so lovely in the little basket making everyone happy who received them. Hello Tom! Greeting from PA. I came across your website searching for answers to the ever confusing question of removing suckers from tomato plants. I have not done so and will not after reading your take on it. My Dad never did, but my ex-husband did. Loved reading about life on the island. Thanks!! HELP! I went crazy yesterday and over-pruned my three plants. There are barely any leaves or stems left! I honestly don’t know what came over me. They were growing like crazy, so I had to go to home depot to grab some steel supports & twine. Before I knew it, they are barren looking (except for the HUGE green fruits). Ugh. Anything that might help at this point? Actually not to worry. 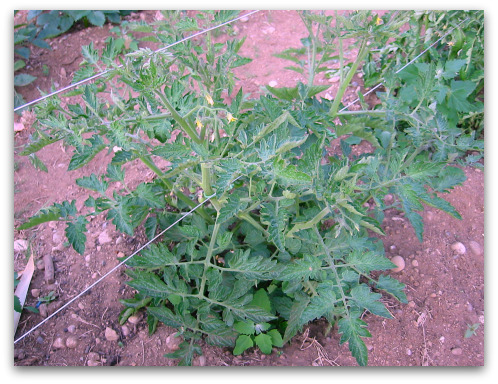 Tomatoes are amazingly resilient and should bounce back in no time with new foilage. Seriously, you can pull up the plant at the end of the season, hang in a cool, dry, dark place and the plant will still ripen the fruit on the vines. At this late time in the growing season, it’s unlikely you’ll get a lot more new tomatoes anyway. Just keep the plants watered if wilting under summer’s heat, oh and no more pruning. Good luck. I’m with you on pruning suckers. However, I do have a cage option that we have used for years and which gives less work with more production as well as helping keep down the weeds. It is absolutely NOT those glorified coat hangers/instruments of torture from the hardware store. We learned many years ago that heirloom tomatoes eat those for breakfast and ask for seconds. NA, Love your site and the fact that you grow so many types of heirloom tomatoes. Do you have any pics of your tomato cage? If I lived in Ohio, I’d be on you CSA list as quick as I could say Beefsteak. Tomatoes are a real challenge in our cool maritime climate. We get a lot of wind around here, so my trellises are a combination of wood, string and metal. In good years the tomatoes can reach six feet. This year….welllll…it’s tough just getting them in the ground and keeping them from freezing. The main pruning I do is just to direct growth if they get too big, as end of season to avoid setting tomatoes that won’t ripen and push more energy into those that will, and sometimes on lower limbs to deal with septoria. I find it matters if they are determinate or indeterminate. Some plants like the determinate ones I let bush. The indeterminate I want some order to. I want some focus. I want some discipline. I want some damn tomatoes already. I pinch! This is quite an interesting unconventional perspective, and I like it. I’ll have to resist pinching those suckers, and see what will come of those baby branches. you guys are killing me. today I pruned, trellised, pinched and propagated with a paintbrush. In Alaska, on the coast, it is all a crapshoot. I pruned one hoop house; did not prune or pinch the other ‘cuz I got tired after yoga. yikes. If I don’t have to pinch should I give up tickling too? I say give yourself a hand for trying to grow tomatoes in coastal Alaska. I used to live in Juneau, and most of my plants survived growing under the eaves. So here’s to your first ripe tom and BLT (vegan or otherwise) of the summer! You make an interesting point but unfortunately, i have pinched off the suckers on some of my tomato plants. Luckily, i still have lots of tomato plants that i need to pot into bigger containers so i will leave the suckers on those plants and do a comparison test although they are different tomato plants. I’m also using stakes with my bigger tomato plants as opposed to cages. I just can’t justify paying for cages given the amount of tomato plants we are growing, and we are growing a lot – A LOT! you’re all a bunch of lazy whiners. suckers only need to be pruned on indeterminates, determinates don’t need pruning. pruning is done to indeterminates to aerate and prevent disease, and to concentrate energy on the fruit. you can not prune if you want to, but don’t present it as if it’s wrong to do so, that’s rediculous. you’re just lazy. Hi Boo Hoo, wow you went from 0 to 60 in mere seconds. While I welcome your opinion, there’s no need for name calling. I assure you, I am anything but lazy, which I expect is true of other commenters on this post. This is about exchange of ideas and practices, and learning from each other. Share your opinion, but please leave the labels and tomato tossing at home. Nice retort…boo hoo, a word of advice, just a little chicken poop goes a long way, expecially if it isn’t mature. THANK YOU!! I have stayed silent on this issue, even though it’s a constant barrage of “pinch this” and “pinch that”, it drives me nuts. I know that in September I will have too many flowers & too many suckers & too many small fruits… but I’ll risk that just for the sake of getting MORE tomatoes! I plant my tomatoes in earliest possible June (I live near Edmonton, AB, Canada we still get snow in early June nowadays, so I am forced to wait!) and have always just let them go crazy in their south-facing, stucco-walled mini-climate. I buy small-ish plants & end up with enormous 4-foot-squared plants by beginning of August. By the end of August I pinch out suckers, but never before then. I actually read a couple of days ago that “the suckers do not flower or produce fruit ever” — HUH??! Mine do! I am SO HAPPY to finally see someone else who is a “good gardener” that leaves them be, and thank you for posting it! Hopefully others will start to understand to leave them alone! I know this is an old post, but I just found your blog this evening, and I will be back every possible chance, I love the layout & your writing style! Experiment and do what works for you. I’ve pinched suckers and I’ve left suckers alone. And I’ve had sucess with both options. I think it depends on the variety of plant and the growing conditions. Hi Renee, I think that is good advice. My first inclination is to not bother pinching the suckers, but sometimes I do if I want just a few big slicing tomatoes off the vine. I say experiment and find out what works best for you and your garden. There will be years of learning hard lessons and those where you’ll feel as though you’ve done everything perfectly right. I have been growing tomatoes, alongside my dad, all my life – love the entire process from seeding in the last of winter’s grip to devouring them fresh from the vine. For the most part I think it’s preference as to if you remove the suckers. I let the plants tell me what they want and need. As far as expense of cages: My dad purchased a roll of concrete wire about 25 years ago. He snipped it down the center (leaving raw prongs to which stick in the ground and hold the basket upright) then he cut lengths about every 11 sections then made cages. He left the raw tines on the bottoms of the cages to stick in the ground. We are still using the same cages and will probably for another 10 years. Why we pinch: Because we use cages and pull the stems up as they grow they tend to be congested until they grow enough top the cages so we pinch the first suckers to keep from having to deal with mildew and fungus. If I were to grow tomatoes on trellis I’d probably only pinch when it allowed me to keep them neatly trellised. If I used stakes I’d probably not pinch at all. We grow around 80 plants of canning tomatoes, 8 slicers (mixed varieties) and 2 grape or salad. Wise words Anna, thanks for the insight and experience shared. What varieties are your favorites for canning? Ever try hilling ur tomatos. I do and it works wonders for keeping moisture at the roots and also since the vine can grow roots anywhere along the vine it allows the plant to draw more moisture and nutrients into the plant. As for suckers this is the first year I tried taking them off even if they already had flowers. So will see if it works. Last year we had late blight and I got barely any fruit from the 38 plants i had so this year i put 45 in the ground. Hi Doug, thanks for the tip. I’ve never tried hilling them, but I like the practice based on what it accomplishes. I’ll give it a try. I usually plant my toms in a deep hole, pinch the lower leaves off, and then fill the soil around the stem, which also works well to promote more root growth and stability. Here’s to a bumper crop for you Doug! I pinched this year so will see what happens. To keep them growing during the dry summers here in pa i hill them up almost like potatos. The vines can grow roots anywhere so it actually helps them pull more nutrients for a thicker stalk. Hi Tom, a point about the fertilizing. I saw a tip on a Youtube clip about two separate stages for fertilizing during the whole growing season. He reckoned that we should use a high-ratio of N-P-K fertilizer during the first stage, to promote foliage growth. Then, once the foliage is well established, and the fruits are starting to come on strongly, to switch to low-ratio N-P-K fertilizer, to divert the energy from the foliage to the fruits. Apparently the N (nitrogen) part of the fertilizer mix promotes the foliage, while the P (phosphorus) and the K (potassium) parts promote the fruits’ growth. Can you comment, please, on the truth in this? I’m in New Zealand, and this time of year we are a month into our tomato-growing season. I’m growing Big Beef, Moneymaker, Sweet 100 (cherry) and Antarctica, in all sorts of experimental configurations, 34 plants so far, both in garden and in bags. I have a tiny plot of land around my small townhouse, and these plants are situated under the eaves, in the only location that gets enough sunlight hours for tomatoes. Good-looking results so far, but it’s been a daily task to search them out for the tiny green critters that I’m sure had taken such a toll on my plants last season, before I learned about them! I try to stay spray-free, but I’m looking seriously at Neem Oil spray. Do you recommend that? My last point is the variety and their use. Last season, I grew tomatoes for largest size and density, because I wanted to try dehydrating them, and the fleshiest fruits seemed the best prospect. The results were ok, but left me with doubt about the safety of storing the dried result, where the slightest moisture can turn the slices bad. This season, I’m going to try canning (we call it bottling down here), and freezing – both for regular eating during the cold months, and for cooking into curry sauces. I found a web-site yesterday that suggested growing cherry tomatoes to freeze whole – a very time-saving way to preserve them. I like that idea, as the skin remains intact and seals in the goodness. (It will be interesting to see if they taste as good as “just-picked”, after slow thawing in the fridge.) Also, freezing avoids the destruction of vitamin C that happens with canning, and even with dehydration. Although the high temperature of the canning process destroys vitamin C, it enhances the lycopene content that our bodies can use, and lycopene is a valuable anti-oxidant, that wards off cancer. So, canning and freezing together seems the best storage solution. So – lots of experimenting for me this season! Thank you for your great page, Tom. Very informative! 1. John, I’m not much of expert in the fertilizer department. What I have found is too much fertilizer does encourage foliar growth in tomatoes which may result in lush plants and fewer tomatoes. I’ve never tested that, so it could be a bunch of hooey. Maybe the extra leaves power the production of more tomatoes? Not really sure. Most of my growing pals say hold off fertilizing once the first blooms appear or first fruit sets. 2. In the realm of Neem oil, I don’t recommend that, just because I’ve never used it. Perhaps my advice would be to just squish aphids when you see them, that is take a couple fingers and gently mash them around the stem. As for tomato caterpillars, I just pluck them off and feed them to the chickens, though sometimes even the chickens say, “We ain’t touching that!” Best bet in my opinion, is not to spray a thing. 3. For dehydrating tomatoes, you want to go with tomatoes that have the least moisture content to begin with. The big slicers are way too juicy and dry up with little meat to speak of, or they have tendencies to mold out. Use pasta or sauce tomatoes to dehydrate; they are low in water and high in flesh density. Varieties like San Marzano and Roma work very well. I’ve tried a grape variety called Juliet, which works, but end up more like a tiny dried cranberry. Good Luck John, Happy Growing in your beautiful homeland. For the last 3 years I’ve been patio gardening non-GMO organics, my tomato plants (all varieties) grow from hanging baskets (the kind with coconut straw). They do ok, but I didn’t get many tomato’s last year off a few of them, so this year I started pinching. I didn’t like it, but I discovered that if I waited until the suckers were actually about 3 to 4 inches long and broadcasting their own leaves, I could put them in water until they sprouted some roots, and then plant them back in dirt. I hope they continue to grow and produce and independent plants. But I’m not comfortable with the pinching, so I think I’ll halt the habit for the rest of the season and see what happens. Oh! I also heard that giving tomato plants plant food when tomato’s are on the vine slows the ripening of the tomato’s because the energy from the plant food gets put into growing more leafs, not more tomato’s. Not sure how true that is, so I’m going to experiment this season on some of the plants to compare one being fed and one not being fed after they have tomato’s on them. The only reason I was feeding was because since they are in hanging baskets, the nutrients from the soil get washed out faster. Though I hang the baskets in layers of 2 and 3, so that when I water the top basket, anything dripping out the bottom falls into the one below it, and same for 2 and 3. Let me know what the season yields and how your experiment went. Hi, I am so very new to growing tomato plants. I just read on several sites that I should pinch back the tops of the tomato plant that , this would help my plant yield a better harvest. So, I did it. I am a little concerned as the tomato plant only had one blossom at the top of the plant. I then found your site and now I am more concerned I may have hindered my plant. My plant stands at about 2 1/2 feet high and I am growing it indoors in a large well watered vessel. Did I just kill my plants chances at making tomatoes? Hi LR, It’s a real challenge to grow a tomato indoors, even with grow lights. As a tropical plant, the tomato wants lots and lots of light and suitable heat to produce flowers, foliage and fruit. You may have the best luck with small tomatoes like cherry, and pear, and salad tomatoes. Your tomatoes with send out new shoots, not to worry. Good luck and here’s to your first tomato. If you have a bright outside area, you may want to move it outdoors, but gradually from shade to light as the new sun’s intensity may shock the plant and burn the leaves a bit. I have a tomato plant (yellow pear) that is like 11 ft. tall and has bloomed many times but never has produced anything at all…I did however plant a little later then normal ( the mother day weekend) Am I doing something wrong or what’s going on ? Hi Lee Ann, hmmm, an 11-foot tall tomato plant? Are you sure it’s a tomato plant? It seems odd that a plant healthy and happy enough to produce an 11-ft vine would not be setting fruit. Sometimes if you over fertilize tomatoes, the energy goes into leaf and stem production, not fruit. That may be the case here. Yellow pear tomatoes are pretty prolific producers, so if I had to guess other than over fertilizing, I’d say your problem may be too much shade, or too hot a temperature to set fruit. Perhaps, take a stem to your local nursery and see what they have to say about it. Good luck. Thanks for this article. I’m a confessed cherry tomato addict, and have been growing them since I was six. And always pinching the suckers. Now, at fifty-seven, it finally dawned on me that no one ever told me why. I promise to try and resist the urge next year! I was always told to prune a tomato and that it will yield better fruit but what you stated here makes sense, it is almost how it should be or was made to be! Thank you for this informative article and sharing your experience from that first spaghetti word! I was wondering if I need to and how often should I work in compost for better fruit bearing or is water and sun enough? Hi Jan, working in some compost into the soil is a great idea for keeping nutrients and minerals in the soil from year to year. You can always top dress that is once you plant the plant circle the dripline with rich compost and working it into the soil a little. Selectively pinching suckers absolutely can result in higher production and disease resistance. Ultimately it depends on your environment. In areas with very high humidity and moisture, pruning suckers to promote airflow can help plants resist blight and other diseases. Pruning the lower leaves and suckers reduces the plant’s exposure to diseases and pests. If you have an accommodating climate and plenty of space, you may be able to let the plant bush out and have spectacular yields with little or no pest or disease damage. That’s not the case for many growers, and selective pruning can help. Pruning suckers is essential if you with to maximize yield in small spaces. I’ve been growing tomatoes in square foot gardens (1 tomato per square foot) for years now. I get less yield per plant, but considerably higher yield per square foot. This method is not suited for determinate tomatoes or smaller tomatoes like cherry or grape varieties, but it works incredibly well for larger indeterminate. The key techniques lie in vertical training (they’ll easily reach 6-8+ ft) and pruning all side suckers to develop one primary stem per plant. Single plants still produce a huge amount of tomatoes (10-20lbs + per plant depending on variety), and I’ve found that the fruit quality is much higher, too. Fruit ripens in sets and is far easier to harvest. It takes a bit of upkeep, however, so many people will prefer the “let ’em bush” method. Either method is fine, and what’s best for you might not be best for someone else. If you do either method well you’ll be swimming in tomatoes. Thanks Bertrand, good points all! We live in the Pacific Northwest on southern Vancouver Island. What is your feeling on taking off bottom branches once tomatoes are starting to form. Also, we are gardening in raised beds and I have always put some slow release fertilizer in when planting – should we be liquid fertilizing during the growing period until fruit starts to show. Hi Mel, I wouldn’t use liquid fertilizer on tomatoes as it tends to accelerate foliage growth at the expense of the fruit. More green leaves and fewer tomatoes. Once tomatoes develop there’s no harm in removing bottom branches, but I don’t bother, unless you want to improve airflow and keep a tidier tomato bed. For the past three years we have been experimenting with straw bale gardening. Results are mixed and we’ve learned a lot. For example, grape tomato plants are more productive than beef steak. We only grow four plants (neighbors won’t take our overflow ;)) in two straw bales. Two years ago! because we get so much shade in our yard, I built a frame and put it on wheels so I can move the plants to follow the sun. Works great, but learned that stakes and cages don’t work because as the straw decomposes the stakes lose support. So last year I added a wood and wire trellis to the frame. Works great. Next lesson was to use last year’s partially decomposed straw bale instead of using a “new” bale. We’ll see how that works. I appreciate your thoughts on pinching suckers and watering. We’re pinching two plants and leaving two alone. Only watering at base of plant when leaves start to wilt. Bottom line- taking into consideration the cost of constructing the frame, etc. these will probably prove to be the most expensive tomatoes on the planet. But experimenting like this is much more fun than just going to the supermarket. Tom, I just want to take a moment and say thanks for running an informative and terrific site! I’d been hearing all this talk about pruning the suckers off tomato plants, but could not remember either my grandparents or parents doing it – and my grandparents made a living & raised 6 children off their orchards and gardens. After stumbling across your site I thought, why not, I’ll leave the suckers alone and see what happens. Lo and behold, I am very happy to report, we have nearly 50 tomatoes on 2 cherry tomato plants and a number of those grew on “suckers.” As well, on our 1 lone plum tomato plant, 3 of our 5 lovely fruits are on one “sucker” stem. I also decided to use your trellising idea for our tomatoes and have to say, that was a success too. While I grew up on a farm, this is my first year having a pallet garden at our apartment and so far, I am beyond thrilled with our results. Plan on posting a photo of that on Instagram this weekend & will make sure to give credit where it’s due. Again, thanks so much for your wonderful posts and tips, Tom!! Tom, Regarding Crystals high praise, never heard of anyone pinching cherry toms. Surprised you didn’t mention it to her. Would like to recommend using 12ft. rebar driving them at least 4ft. and ” WAHLA ” lifetime stakes. Enjoy your “column”. I have been searching for almost 2 hours and still can’t find information on what to do with dead flowers. Do I remove them? Hi Rose, for cutting garden flowers, it’s a good idea to remove the dead or spent flowers if you wish to get more blooms, yes. Deadheading encourages re-blooming on annual flowers, not so much with perennials, trees or shrubs. Hope this helps. There are some nuts on the roots of my tomatoes in my garden that I think is preventing my tomatoes to bear fruits,I want to know if they are sickness in the soil? and how do I get them out. I came across your website while looking up “whether to remove suckers with blooms on them”,and discovered quite the informative comments on your web page. I think I’ll leave well enough alone and not sucker at all this year. Thanks for the posts and enjoyed reading everyone’s opinions. Bob thanks for the thorough and very interesting response. I love seeing what others are planting and growing in their gardens. Hi Tom. I would like to get your thoughts on pruning off smaller fruit. For example on my Parks Whopper, one truss has 2 baseball size, 2 golf ball size, and 2 pea sized fruit. Do you think I should clip off the pea sized ones? We’re already getting to the point where blossoms are dropping because it’s to warm and humid so I don’t expect much more new fruit set. I am also pruning any new suckers from the top part of the plant. Thanks for any tips/advice! I don’t think it would hurt to pinch the pea sized fruit. Maybe experiment and leave them on one plant, remove them on another and see if the pea-size guys reach maturity. I suspect not, as the big energy is going in producing larger size fruits to maturity. I am a first time grower and WOW what a website! I have learned so much that my head is spinning!! I NEVER KNEW THERE WAS SO MUCH TO LEARN ABOUT GROWING TOMATOES!!! I thank you and all your readers comments and will put into play what I have learned. I don’t know what type of seeds that I planted but will send you a picture when (I’m not going to say “if”) they produce. Thank you so much Tom and everyone else. I feel confident that your failures (sorry about that) and your advice are what is going to help me succeed! Thanks Dozy, I always say the best thing about having my blog, is bringing folks together over the joy of gardening, the warmth of food, and kindness of helping others. So glad you joined the conversation! Hi Tom. I just found your site. So glad you are still here! Two days ago I sprayed my six foot tall many stemed beefsteak tomato plant with soapy water and borax and killed most of the leaves. There are large green fruits now exposed to the Florida sun. What do I do now? Yes, at this point I’d let any and all leaves grow, whether a sucker or a stem. The plants may recoup, you’d be surprised how resilient they can be. Going forward, I would stay away from spraying tomatoes with anything. I don’t spray anything I grow, whether a home remedy or commercial pesticide. It’s just not worth it. It’s all poison for the most part. It may take a couple years for your garden to balance out with natural predators and solutions, but give it a chance. It’s quite freeing to not worry about spraying and let nature take its course. Think about it …and good luck, here’s to your first BLT!